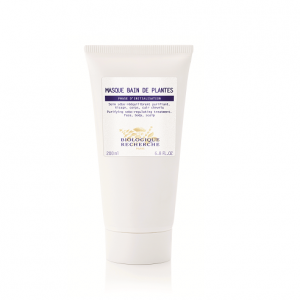 Masque Bain de Plantes is a plant-based rebalancing mask whose ingredients regulate the number of active sebaceous glands as well as gently purify the skin. On one hand, the combined us of Fireweed, Terminalia, Nasturtium and Zinc in the formulation of this mask has a sebum-regulating along with reduced sebum production whilst the presence of Enantia Chlorantha and Oleanic Acid leads to the reduction of skin and scalp sebum content as well as a visible tightening of pores. On another hand, the Clay, Extracts of Heartsease and Yeast agents reinforce the detoxifying action of this treatment. This purifying mask can be applied to the face, body and scalp to restore and eliminate excess oils for a complete skin detox. Ideal to reduce the shine and unsightly imperfections that arise when suffering from seborrheic Skin Instant®. Sebo-regulating active agents: Epilobium extract, Terminalia extract, Nasturtium Extract, Zinc Extract, Enantia Chlorantha, Oleanolic Acid, Stinging Nettle Extract, Burdock extract. Purifying and Detoxifying active agents: Wild Pansy Extract, Yeast Extract, Green Clay, Essential Oil of Rosemary, Essential Oil of Thyme.